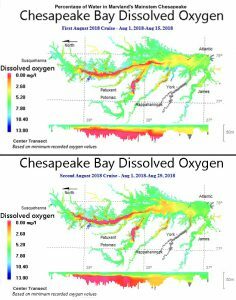 Dissolved oxygen conditions for Maryland’s portion of Chesapeake Bay returned to near average for the month of August, reports the Maryland Department of Natural Resources. The department tracks hypoxia throughout the summer during twice monthly monitoring cruises. Low dissolved oxygen volume was at a record low (0.26 cubic miles) in late July, due to sustained winds and high flows from torrential rainfalls in mid-to-late July. As stormy weather subsided, and warmer days returned, hypoxic water volume (areas with less than 2 mg/L oxygen) rose to 1.08 cubic miles in early August, and 1.26 cubic miles in late August. Warmer waters hold less oxygen, and as freshwater flows subsided, water column stratification increased, making it more difficult for oxygen to mix into lower depths. 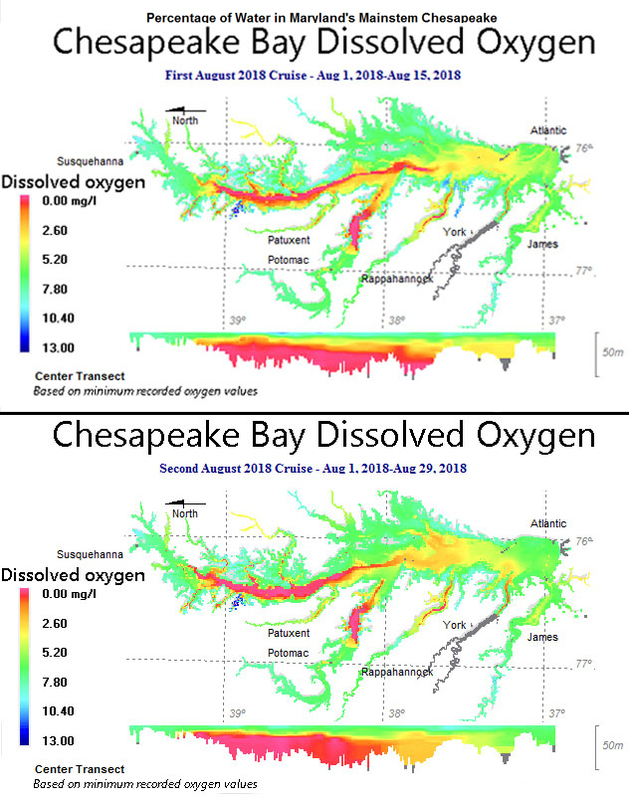 The hypoxic zone appeared to recede northward from early-to-late August, but it should be noted that the station at the Maryland/Virginia line was not sampled in late August due to high winds, which could result in a lower estimate of hypoxic volume for bay waters. In the beginning of June, the National Oceanic and Atmospheric Administration, U.S. Geological Survey, University of Maryland Center for Environmental Science and University of Michigan predicted a slightly larger than average hypoxic volume for the bay due to higher spring flows and nitrogen loading from the Susquehanna and Potomac rivers. 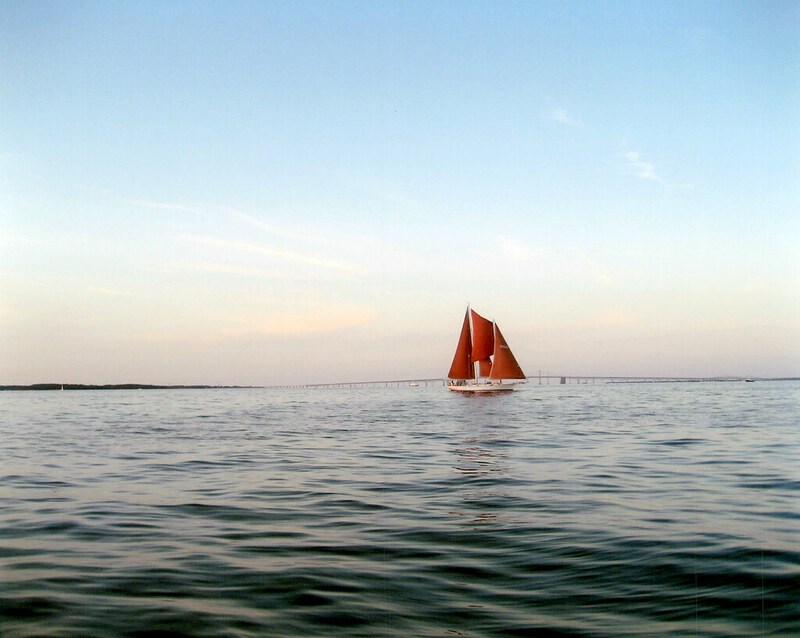 Crabs, fish, oysters and other creatures in Chesapeake Bay require oxygen to survive. Scientists and natural resource managers study the volume and duration of bay hypoxia to determine possible impacts to aquatic life. Each year (June-September), the Maryland Department of Natural Resources computes these volumes from data collected by Maryland and Virginia monitoring teams. The Virginia mainstem is monitored by Old Dominion University under contract to Virginia Department of Environmental Quality. Data collection is funded by these states and the U.S. Environmental Protection Agency’s Chesapeake Bay Program.